Rendering of the Cal Poly Pomona Rose Float Lab and Complex designed by the architecture firm Gensler and set to break ground in 2018. 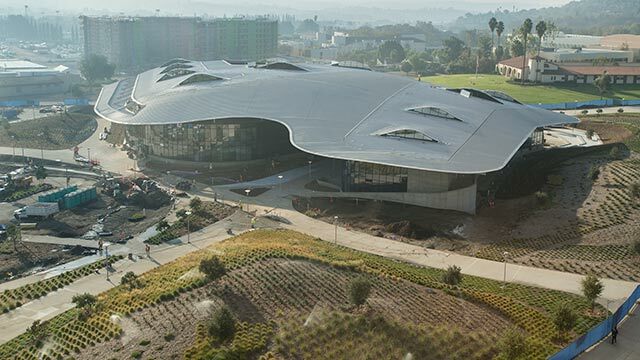 Cal Poly Pomona has reached its initial fundraising goal for the new Rose Float Lab and Design Complex and plans to break ground at the end of 2018. The university is expected to open the new lab in 2020, providing future Rose Float students a space to build beautiful, creative and innovative floats. 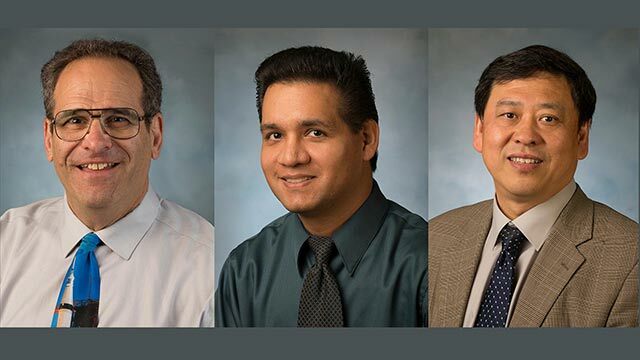 Leadership gifts from The Ahmanson Foundation, the Tournament of Roses and committed alumni vaulted the university to reach its goal of $3.7 million. 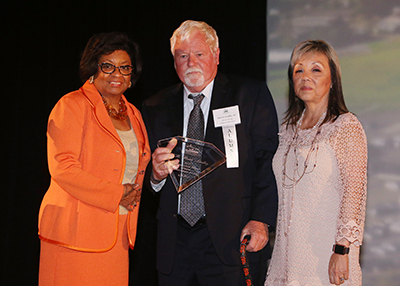 The project is funded primarily through private donations, including a $1 million lead gift from alumnus Butch Lindley and his wife Vivien (pictured above with President Coley). The campus expects to break ground in December on the new complex, which will provide about 14,000 square feet of indoor and outdoor work space. 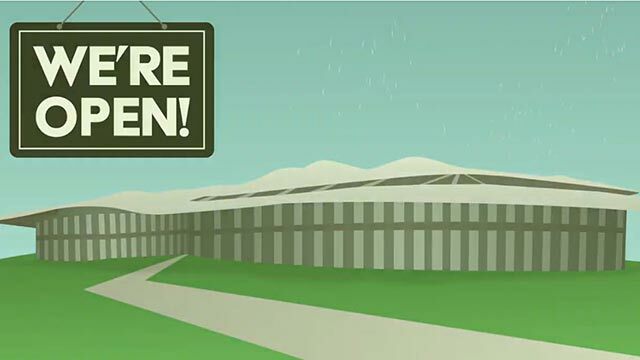 The facility will include a fully enclosed float construction bay, design workspace, storage facilities and a courtyard to host large numbers of volunteers. The $3.7 million project is funded primarily through private donations, including a lead gift from alumnus Butch Lindley and his wife Vivien. Leadership gifts have also come from Jerry and Cybel Maio, Michele Gendreau and Don Huntley. 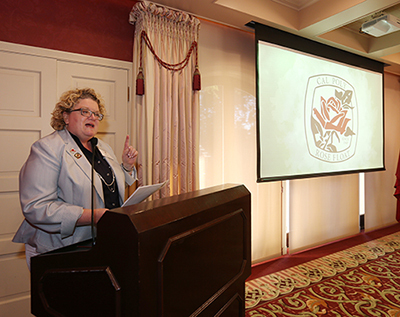 Michelle Gendreau, one of the major supporters of the new Rose Float lab, speaks during the unveiling ceremony for the Rose Float Lab and Design Complex. At the Lindleys’ request, the new lab will be named in honor of alumni Don Miller and Ron Simons. Miller, who died in 2004, was a student at Cal Poly Pomona when he pitched the idea of entering the Rose Parade with less than 90 days to go. On Jan. 1, 1949, the Cal Poly Universities’ made its Rose Parade debut with “A Rocking Horse,” winning an Award of Merit. Ron Simons, nicknamed “Mr. 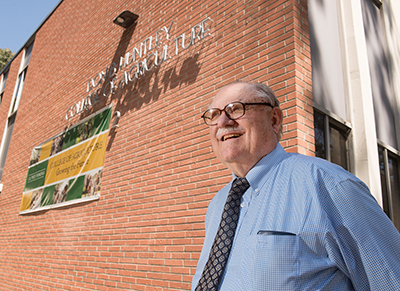 Cal Poly Pomona,” has been a leading supporter of the Rose Float program for nearly all of his life, from his time as a student in the 1960s to being an administrator in the Division of University Advancement. On the campus’ 1962 float, “Man on the Moon,” he was the astronaut on the moon, seven years before Neil Armstrong stepped on the moon. The fundraising campaign continues to raise funds to enhance the lab and design complex, with facility improvements, supplies and equipment. 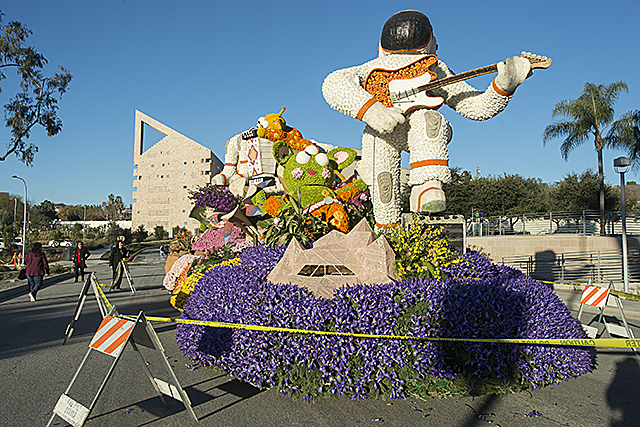 For the past 70 years, Cal Poly Pomona students have participated in the Rose Parade. They currently build their award-winning floats in an open-air warehouse structure erected more than 30 years ago by Rose Float students. 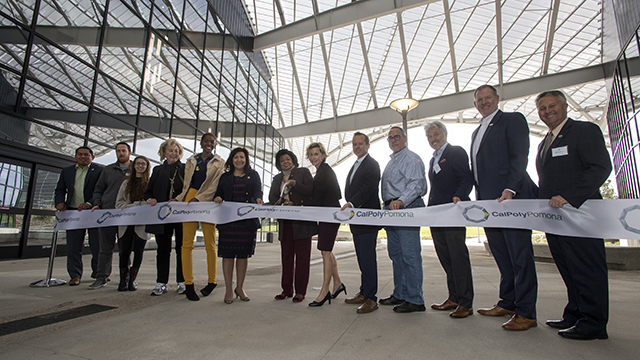 The new complex will provide appropriate protection from weather; better security for the equipment, electronics, and tools; and a space specifically designed to enhance student learning, collaboration and innovation both indoors and outdoors. Leadership gifts have also come from major supporters such as alumnus Don Huntley. 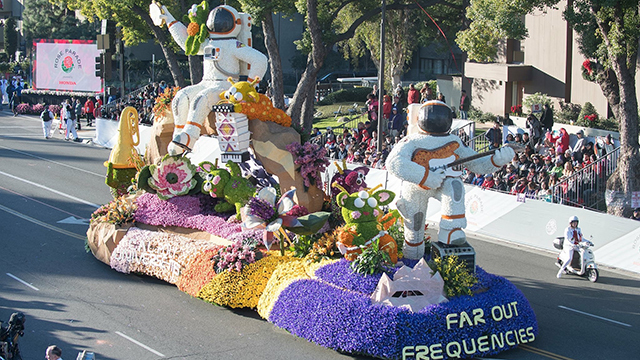 Competing against professional float designers, Cal Poly Universities’ Rose Float team has won 58 awards over the years, including 10 Founder’s Trophies for the most beautiful float built and decorated by volunteers, and eight Princess Trophies. In the 2018 parade, “Dreams Take Flight” won the Past President Award for most outstanding innovation in the use of floral and non-floral materials. The Rose Float program has been a leader in innovation, being the first to use hydraulics to power innovation (1968), the first to use computer-controlled animation (1978) and the first to use fiber optics (1988). 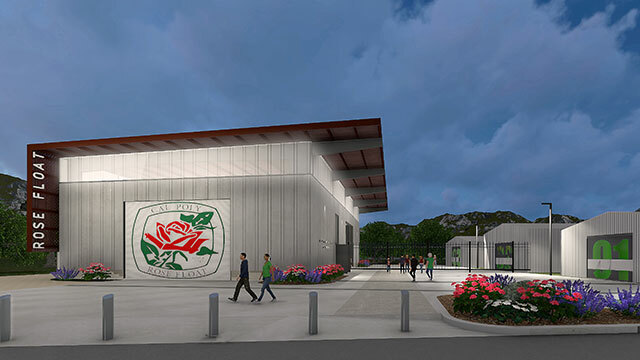 Visit the Rose Float Lab and Design Complex website for more information, including renderings and additional giving opportunities.